Blackhawk 4306 Level 3 Tactical SERPA Holster FREE SHIPPING! The Blackhawk 4306 Level 3 Tactical SERPA Holster is designed for the most dangerous operational environments, combining superior security measures with rapid accessibility. 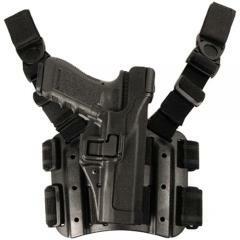 Its Y-harness suspension system keeps the holster vertical for easy access, and rides low enough on the leg that you can still use your pocket. Its non-slip rubberized straps keep it in place as you move, and adjust to ensure a secure fit. The holster's full-length design provides maximum protection for the rear sights while still allowing unrestricted access to the grip. It features a SERPA Auto-Lock release and thumb-activated Pivot Guard for security, as well as a detent screw that provides a custom balance of passive retention and accessibility. To be honest it's the first plastic holster I've used. I almost sent it back, the thumb safety portion of the retention system really irked me. Thought I would get the level 2 instead. Then I built some muscle memory. Love this holster. I like the audible confermation that the weapon is in register. It's slick. Nice rig. My weapon (H&K45) fits perfectly. I bought this for a Glock 21. It fits well and is comfortable. The topthumb lock tends to slip when I bump into something that presses the gun handle against my thigh which leaves just the fingerside lock holding the gun in place. I do like the easy draw action and really like how easy it is to re-holster the gun. Is it necessary to utilize the belt harnesses with this holster, or are the thigh straps sufficient? For better stability and security, the belt straps are highly recommended. ©2002-2019 CopsPlus.com: Blackhawk 4306 Level 3 Tactical SERPA Holster FREE SHIPPING!